New Tennis Legend Collection has arrived! Slazenger Heritage is not all about golf. Our brand has a strong connection with the history of one of the most beautiful grass sports, tennis. It was already in 1902 when the logo of Slazenger appeared for the very first time at Wimbledon tennis ball becoming the official ball supplier for this tournament. By now is the longest unbroken sponsorship in the sport´s world. But it was only the beginning of the relationship between Slazenger and tennis. Since then many tennis legend showed they affinity with our brand. Like Fred Perry or Manolo Orantes who chose Slazenger rackets to play their matches. In Slazenger Heritage we love our history, so today we present you our brand-new Tennis Legends Collection featured by 3 new styles inspired in many historical moments of this amazing sport. White is an official colour of tennis uniform, so our first style is a white V-neck sweater made 100% of soft cotton-blend with a big vintage logo, the same which appears at Wimbledon tennis balls, knitted across the chest. It´s designed for a slightly loose-fitting style and it´s available in sizes from S to XL. Although white is an official colour, we also offer a version in navy. 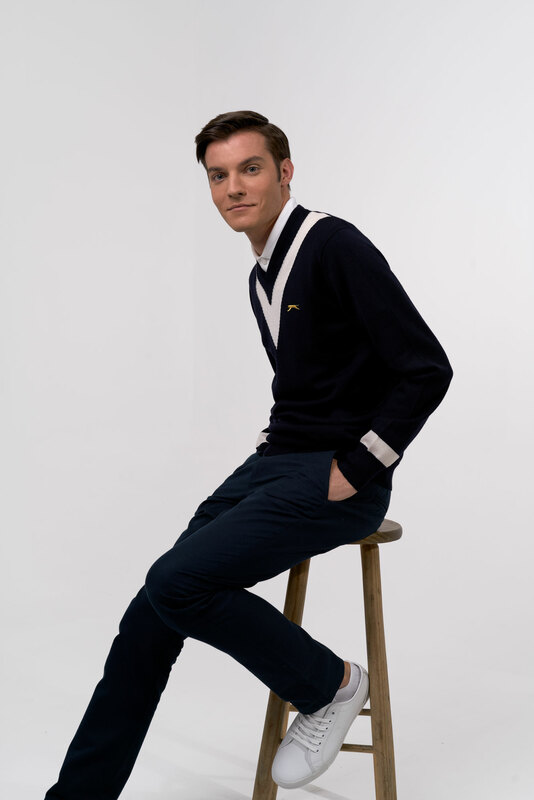 Our second style is a navy jumper with a white V-neck intarsia inspired in tennis legends like for example Fred Perry. Is made of extrafine merino wool with a hint of elastane for flexibility. Merino wool is a high-quality material obtained from a specific Spanish breed of sheep and since 1920, due to its qualities of an effective temperature regulator, it was used by many players of different sport discipline. 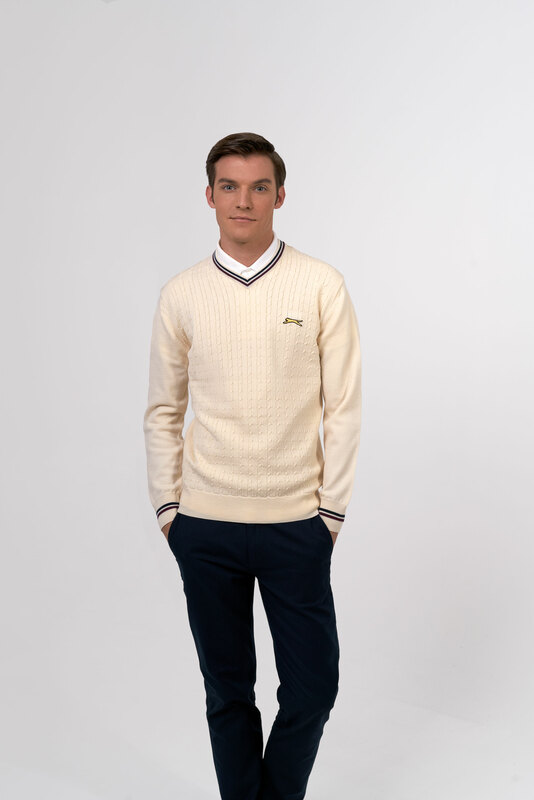 The white V-neck collar and the Slazenger panther is embroidered in gold. It is designed for a fitted cut and it´s available in sizes from S to XL. Other sweater inspired in a style of tennis legends like Bill Tilden. 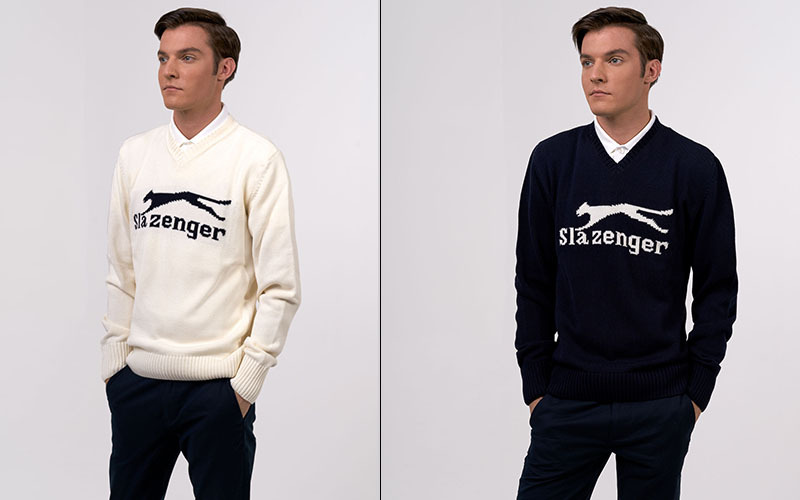 It´s a white V-neck jumper with a cable knit at the front and the Slazenger logo embroidered in gold. Just like the last one, is made of merino wool with elastane and it´s also designed for a fitted cut. Available in sizes from S to XL. Don´t lose your opportunity to wear a legend! If you need a help with deciding the perfect size or you have any other question, don’t hesitate to contact us.